An open design benefits health and well-being. Allow your indoor & outdoor living to flow seamlessing, welcoming fresh air and natural light throughout your living space. Proper lighting around a home or business has been shown to reduce crime potential by up to 50%. By lighting dark shrubs and facades, you can eliminate hiding places and increase visibility for neighborhood watch and police patrols. Dramatic, beautiful and breathtaking effects that increase curb appeal and add value to your home. Accent lighting allows you to enjoy your yard even at night. An aura of elegance surrounds your property, while creating a soft and inviting ambiance to greet your guest at the door. You can also customize specific zones depending on the occasion. An entrance mode illuminates the driveway and pathways for coming home at night, and an entertainment mode is perfect for total display. Creative modes can also be designed where lighting is installed close to the home, creating mosaic patterns on the walls as it shines through the landscaping. Just think of the possibilities! Archonomy is a blend of the words Architecture and Anatomy; because architecture shapes our human experiences on a daily basis. Our aim is always to diminish complexity to make life easier and better for people. Our responsibilty is to help preseve the earths resources while meeting the design demands. Landscape Architecture imposes itself upon nature. Beautiful visionary design and our complex ecosystem need to combine naturally to create a true sense of space. The Transitional project by Ryan Hughes Design Build illustrates a smooth transition from the beauty and style of interior spaces to comfortable and inviting outdoor living. As one moves further into the covered outdoor space, calming waters and fire features welcome you for entertainment and enjoyment. From submerged lounging in the pool area to fireside deep seating, to a complete outdoor kitchen and conversation spot, each element is custom crafted to blend with the overall style of the home. Transitional, geometric shaped swimming pool features tanning ledge with ledge loungers. Modern outdoor furniture, unique fire features, an oversized, wooden pergola with stone columns and glass tiles all create the perfectly styled backyard. In pewter and blue, the all weather wicker with weather-resistant cushion deep seating by Patio Renaissance Catalina offers a welcome and soothing spot for relaxation within the modern outdoor living room. An elegant, transitional style swimming pool and patio area with unique fire features is at the centerpiece of this outdoor living area. Stepping pads over glistening waters and glass tiles, are accented by the surrounding wooden trellis with stone columns. A lounge area on each side with modern outdoor furniture creates the ultimate in entertaining and relaxation. The complete rear exterior was renovated with custom, precast door and window moldings, new wood ceilings and beams along with stone wainscoting. These unique enhancements allow for a convenient flow from indoor to outdoor spaces. Seating area with Patio Renaissance Catalina woven wicker outdoor furniture (driftwood weave color) surrounding glass tiled fire pit nestled in corner of tastefully landscaped modern lanai with travertine paver flooring. Luxury outdoor kitchen. Patio Renaissance Barstools, Fire magic appliances, mosaic glass tiled backsplash and bar table, ledgestone bar with granite top and travertine decking. The bold use of color warms all social areas alongside glistening tile and decorative lighting in the Modern Mediterranean outdoor-scape. In the heart of coastal Florida, spa-like splendor is captured with tropical yet European features. All are balanced within this outdoor design from Ryan Hughes Design Build. Multiple levels of travertine tiles and decorative glass create multiple lounging and living spaces in the outdoors. Towering palms to gentle water sprays to crackling fires allow for exotic sights and sounds. Outdoor rooms for cooking, dining and entertaining extend from the home through engineered architectural arches and columns. Cozy, modern outdoor living space with outdoor kitchen with granite bar, stunning glass tile, L-shaped sofa, fireplace, water feature, woven furniture, custom fabrics and ambient lighting. Modern Mediterranean outdoor environment with tropical landscape, stunning swimming pool with shimmering glass tiles and unique water features. Elevated seating area with sleek outdoor furniture with custom coordinating fabrics. Modern outdoor kitchen with granite bar featuring unique mosaic glass tiles, beadboard ceiling and custom furniture with jewel-toned fabrics. Spectacular tropical backyard with free-form swimming pool, raised spa with water features, shimmering glass tiles, fire pit, travertine decking, dramatic led lighting, modern outdoor furniture and lush tropical landscape. Modern backyard living room with built in fireplace with water feature, woven outdoor sofa, bead board ceiling, travertine floor, stone columns surrounded by lush landscaping. Cozy, modern outdoor space with fire pit, stunning glass tiles, outdoor kitchen, woven outdoor furniture, free-form pool with led lighting and travertine decking. Florida luxury living manifested with this perimeter overflow pool by AAA Custom Pools, Inc. Expert, award-winning pool builder, Ryan Hughes Design/Build has created an outstanding backyard retreat perfect for entertaining. 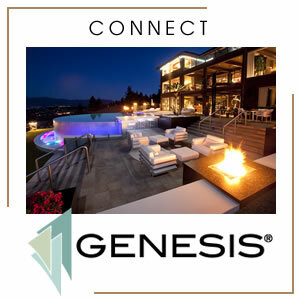 Several cozy lounge areas surround the geometric shaped pool including an oversized, square fire pit area with bench seating, a wooden pergola supported by stone columns encloses a comfortable outdoor sectional with custom fabrics and a glass tiled fire table. The patio dining area is complete with an outdoor kitchen and overhead television within view of the in-pool loungers and adjacent seating areas. Night is the perfect time to enjoy the cozy atmosphere with the use of multiple textures; regal wooden pergola, stone columns, drapery accents, tropical foliage and the most exquisite of elements. Modern pool with raised spa and sun shelf with ledge loungers is perfect for sunbathing or nighttime tv viewing. The infinity edge of the pool displays a wall of shimmering blue glass tiles. This wall creates the unending illusion from the house vantage point. The shallow overflow pool with built-in ground lighting illuminates the edge, transforming this design into a shimmering yet tranquil waterfall art. The secret to a more vibrant, energetic, and happier life can be as simple as a strategic pop of color. In her fifth book, Change Your Home, Change Your Life™ with Color, Moll Anderson reveals how readers can transform their lives for the better by revamping their surroundings. "Life is full of color, and color holds so much power in our lives that most people don't realize," says Moll Anderson. "Color is so much more than meets the eye. It goes beyond something purely visual as it is a full-on sensory process that serves as an amazing source of energy that affects our mood, feelings, and even our behaviors." "With this new book, I want to inspire and help others get in touch with their true inner selves to unlock their own personal color story," adds Anderson. "By looking through past moments and memories – whether positive or negative – this book will teach you how to find your truth and how taking a journey with color can transform and makeover your life." Responsive websites by Design International Media are designed to respond to the user's behavior and environment based on screen size, platform and orientation. Packing a powerful “wow” factor. The Big Time outdoor design from award-winning designer Ryan Hughes Design Build transformed a South Florida home’s outdoor space into something not only beyond expectations; but beyond imagination. MIFF 2017 Gamma Wood (pictured), continues to churn creative designs to attract buyers and has embarked on high technology automation to ensure consistent high quality and to meet increasing orders. According to members of the Jenn-Air Design Advisory Council, some of the latest kitchen design trends include functional items like kitchen islands designed to look more like furniture pieces and open shelving for displaying favorite items.